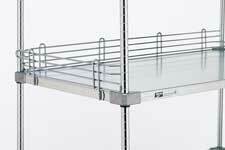 Super Erecta Shelf® All-Stainless Steel Shelving. Solid shelving is available in four widths. 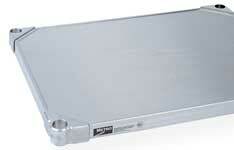 All-stainless, 18 gauge steel construction with 1/8" ship's edge detail helps contain spills. All-stainless design, including stainless cast corners, can be used in cart wash and autoclave environments. New accessories include high-temperature autoclave casters and autoclave cart covers. 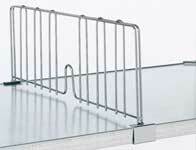 All-stainless solid shelf is designed specifically for cart-wash applications. Sturdy 4" ledges contain items on shelves. Spring-clip tabs included for attachment. The easy way to keep shelves orderly. Eight inch (203) high dividers attach with spring clips (provided). Combine required shelf sizes above with stainless posts. Stainless Posts are fitted with adjustable leveling bolts to compensate for uneven surfaces. Combine required shelf sizes above with stainless mobile posts. Mobile posts accept a wide range of Metro Stem Casters. For Cart Wash Mobile Applications. Stem casters are shipped with donut bumpers. When stainless solid shelving, as part of a mobile shelving unit, is used in an autoclave, the following Metro product guidelines are recommended to ensure optimal product performance and longevity: Stainless, wedged posts with aluminum post caps must be utilized [part numbers 33/54/63UPS-SW Aluminum split sleeves [part number 9986S] with stainless rings should be used to mount solid stainless shelves. Select either hi-temp phenolic casters or hi-temp nylon casters for application. These casters are designed specifically for autoclave environments. Bumpers should not be used as they are not designed to withstand autoclave temperature ranges.